And I seem to have slipped back into the forgetting-to-write mode yet again. Oops. I've taken a few cooking and baking pictures, now I just need to, you know, post them and write about them. Yeah. which I had leftover from when I broke my ankle a few years ago (I figure once I've paid for the thing I might as well keep it in case ... and good thing I did). The boot is much more comfortable and easier to walk in (ditched the crutches two weeks ago), and allows me to take it off and wiggle my ankle a bit. 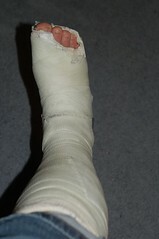 It's surprising how quickly you lose muscle mass - after two weeks in a splint/cast my calf had turned to jello ... nasty. 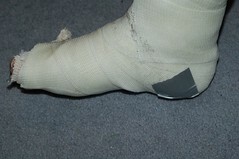 After a few days of doing some ankle movements (keeping my toe still - really) it was a little less pathetic. My four weeks are now up (as of a few days ago) and I'll have a followup Xray/visit this week and am fairly sure that I'll be set free. The broken part of the toe doesn't hurt, but the other side of the big toe must've had a nasty sprain, since it's still stiff and sore if I move it. 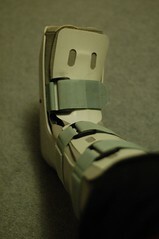 As long as the bone's healing reasonably, though, which I think it is, I think I can at least get the boot off. Here's hoping! posted by Lisa | 10:25 p.m.
Glad it's healing up well. I kept my boot too -- you never know!